Thanks. I didn't read the instructions all the way thru. I like the look of the rounded corners a lot better than the squared look. I will send you a picture of the completed project. "Insert bumper pads into the cover. NOTE: It will help give you a nice snug fit if you use the corner template to round the corners of the foam just as you did with the fabric panels." Could you tell me how the corners become rounded when the Fairfield Nu-Foam bumper pads are square? Does this happen on it's own when the foam is stuffed into the fabric cases? Thanks for all the helpful info you are sharing. @LMoore - 3/16" is really thin -- that's about half the size of 3/8". If you remember your 4th grade fractions, when you turn 3/8" into sixteenths, you get 6/16". So if at all possible, you should try to get something about twice as thick. I don't think it would look right without the cording; it would be too floppy. Here's one option that is just a little bit thicker - 1/2" instead of 3/8" - that would work. Hey! So I looked all over for 3/8" cording with no luck. So I got cording that is 3/16". I think it should be fine... but have never done cording before and wanted your advice- will it look silly with smaller cording? Would the bumpers look good with no cording at all? Thank you Liz, that's just what I needed! 1) Could you show me or tell me how to sew the last end closed? I am SUPER BRAND NEW to sewing, and don't have a clue on how to do it. 2) How do you properly sew in the two ties on the open side? Thanks so much for your help. I will definitely add pictures of the final product when done! Hi Kris -- this project has been done so many times -- a helpful s4h visitor already attempted and succeeded at just what you are considering: a solid pad. She wrote all about it above ... scroll up to read the multiple posts from "Laura R" Regarding the skirt - no we do not have a pleated crib skirt at this time, but I'm sure you could find one by searching online and/or as a standard purchased pattern. Have fun! Hi! I am absolutely in love with your bumper pads and plan to make them this summer as I am redoing some things in my daughters room. However, her crib is not slatted in the back, it is a convertible crib that is made to convert to a full size headboard with no slats. So...what would be the modified measurement of a continuous Long crib bumper for the back, as there would be non place to tie 2 together? And do you have a tutorial for a pleated bed skirt? I didn't see it at the bottom, but wanted to make sure i didn't overlook it. Hi Ale -- on the piping: the seam allowance will be about 1/2". I say "about" because the key is to sew as close to the piping as possible to get a nice clean, piped edge. That may be a teensy bit larger or smaller than 1/2". Line it up for 1/2" and then adjust so your zipper foot is as close to the piping cord as you can safely sew. We don't have a pattern for a hanging toy bag at this time, but I'll put it on the wish list. Hi! I just love your tutorial and I just started making one for the little one on the way, I have a couple of questions, 1. what is your seam allowance when sewing the piping to the 27" x 11 3/4" piece of fabric? is it 1/2"? and also do you happen to have a tutorial or a pattern for a hanging toy bag? like the ones you can find on different bedding sets? I'd love to have one of those as well. Hi DeeMarie -- the amount of fabric will depend a bit on the fabric you select. If you have a stripe or other directional print, you might need a bit more. As the instruction mention above, you need twenty-four 15½" x 2½" pieces for the ties. When I figure yardage, I often sketch it out on a piece of paper. If you have 45" in width or no directional pattern issues, you can cut the ties side by side, which would mean you could get the 24 strips in 30" of length -- but that is cutting very precisely, so I would recommend a full yard. Just wanted to thank you guys for the Stylish Baby Nursery series of projects! I've nearly completed an entire nursery set using all your patterns and am LOVING it. I need to finish the baskets and the throw pillows and my mom is doing the scalloped rag quilt for me, but other than that I'm about done! I've done the curtains, dust ruffle, bumpers, and ricrac blanket. I also made a couple homemade bed sheets! Anyway, just wanted to thank you for the awesome pattern writing and attention to detail! I'll upload a couple pictures because, if I do say so myself, my fabrics are amazing, too. Hopefully those show up! Thanks again! SO EXCITED TO DO THIS!!!! Ugh, if people would just look into statistics. There were 27 infant deaths over a TWENTY year period due to crib bumpers... Likely they weren't watching how they fastened the bumpers, either. Personally, like I said, I'm very excited for this project! Already purchased the pads! (Now I just need to know what I'm having). Re availability of Fairfield bumper pads in UK, if anyone is having the same problemn I bought some online from Amazon. Hi Lauren, I addressed similar questions (not the same size fabric) above, so you can scroll up and read in more detail, but in general, I think you could get it to work with the same 2 yard cuts. You need to cut six 27" x 11¾" pieces from the front fabric and six from the back fabric. A lot depends on what your fabric design looks like and whether the motif will allow super tight cutting. If your design is omnidirectional or horizontal and you can cut the width (27") across your 36" wide fabric, you should be just fine. Another idea is to make a paper pattern 27" x 11¾" and map it out on your fabric(s). Your other options are to trim down the foam inserts and/or make a slightly smaller seam allowance. The fabric I have fallen in love with to make this project only comes in 36inch would it be possible to still do this?? And if so how much would I need? Thank you! 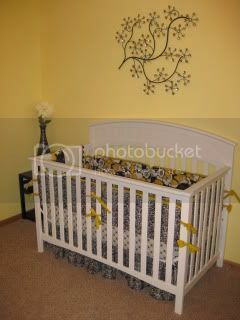 Hi Soon2Bqueen - the crib we used for our sample was very standard. These bumpers are adjustable because of the ties, but they should be a snug fit when tied together. Each pad is 26" in length, which means (without account fabric and piping) they should be perfect in a standard crib... about 52" along the side and about 26" at the headboard and footboard. A standard crib is 30 x 54 and a standard crib mattress is 27.5 x 52 .... so if you have a standard full-size crib, these will work great. What size crib does this fit? (L x W)?? Hi bsurugbychief -- The pretty lanterns came from Good Things Wedding Favors. I am new to Sew4Home.com and LOVE this site! This site makes sewing fun and easy! My current project is the crib bumper, just finished the dust ruffle. I adore the decorative balls that are hanging from the ceiling. Where can I find (or make) something like that? Hi Molly P -- if you use the pads we recommend, they are designed to be completely washable - you can throw the whole shebang into the washer and dryer. That's why we did these the way we did ... way easier than adding an opening on one side and having to remove the pads every time. . Just make sure you pre-wash your fabric before you begin. Hi, I going to make this crib bumper set and I had a question about adding velcro. I'm thinking about adding the velcro so I can remove the pads if I ever have to wash the bumpers. I was wondering if this is something that could be done and if so how would you recommend doing it? I'm think it would be easy to do, but wanted to check first. I'm very new to sewing and I want everything to look nice. Thank you so much! Hello Karen M -- you could do square corners, but if you decide to do the piping, rounded corners are actually easier. Hi. I'm thinking about trying this project for my daughter who is due March 23rd. Would it be possible to do this bumper without rounding the edges? I'm very new to sewing and the rounded edges make me very nervous! Hello mama2be -- I'm so glad you've chosen us for your first project. 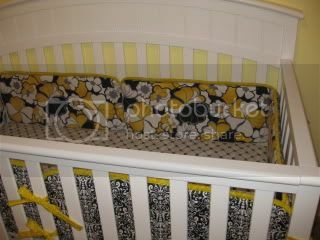 The width of the crib should be fine; the standard 10 x 26 pad should work just dandy for the headboard and footboard. But, along the side, you'd have to trim down the bumper pads in order to get two to fit. You'd need to trim them down from 26" to about 19". That means you'll need to do some math as you go along, subtracting 7" from each length measurement above. Regarding yardage, you might be able to get away with about 1/4 yard less on all the cuts, but without taking the time to draw everything out at the new size, I can't guarantee that. It also depends somewhat on the type of fabric design you choose and if you fussy cut your design. In the grand scheme of things, it might be best to stick with the measurements above and use any leftovers to make some fun matching pillows or little receiving blankets. Have fun! what about making this for a smaller crib? we have a mini crib that measures 28" x 38". what would the yardage be for a crib like this? i'm absolutely a beginner to all things sewing... this will basically be my first! We did Minky on one side of the bumpbers and Michael Miller groovy guitars on the other. My Mom made the crib set with your patterns and I did two of the pillows for the nursery...love it so much! Much better than any store bought set, and I love the fact my son has a handmade gift from Grandma! 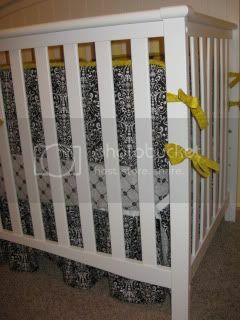 Future gramma, in addition to what Liz suggested about contacting the manufacturer (which is how I found the same info on my grandchild's crib)I also did this to customize my crib skirt. I made one long side of the skirt to fit the longer drop measurement-this would be the longer length used when the mattress was in the 'high' position and I made the other long side of the skirt the 'shorter drop' measurement. The 2 shorter ends of the crib were both left the longest measurement. Now here's what I did for those 3 longer sides to be able to be 'folded' up to match the shorter length when my daughter needs to lower the mattress: after completing all my sewing of the 3 panels and before I attached them big center common piece, on the WRONG side of the 3 sides that are longer; this would be: the 2 short ends and 1 long side, I used fusible velcro squares (which I cut) placed intermittently on the dust ruffle positioned such that she can 'pin' it up to the correct length so they will all look the same-do you get what I'm saying? There's the 'hook' side of the velcro positioned close to the hem and the 'eye' side positioned above it at whatever height it needs to be at to match the short-long side! It's actually a simple concept, but my explanation might not be! My skirt is a box pleat style but it will work for gathered also if that's what you're doing-this way it wil always look custom no matter what position the mattress is in and it's simple for my daughter to adjust. Hope I'm clear? and, if not, feel free to ask me any ?'s. Hi future gramma - sorry, I don't know anything about that particular crib. Maybe you can find the manufacturer online and send them a question. Thank you Liz! Bumper pads all done! They look great! Now on to the next project. Can anyone tell me how long to make a dust ruffle for a DaVinci Meagan crib. None of the stores here in town have one on display to measure and I am trying to surprise the new parents so I don't want to ask them. I would want it to touch the ground at the lowest setting. Thanks in advance for your help!! Hi furture gramma... no need to cut the strips for this piping on the bias. It can be straight cut. The real necessity for bias-cutting is if you are applying the trim (piping, bias tape, whatever) to a curve. Have fun!! I am just starting these and I am wondering if I have to cut the strips for the piping on the bias or can I just cut them on the straight of grain. I have a striped fabric for the piping and not sure how it would look on the bias. Thanks for any help! Hello Aurora -- Thanks for the compliment, but no - we don't sell any of our samples. Our goal is to get YOU inspired enough to make things yourself. You should give it a shot. Even these bumpers are easier than you'd think, especially with our instructions! And choosing your own fabrics is one of the best parts. You're right about what is often available in stores ... not very much to choose from. Come on.... you can do it. If you're feeling nervous, maybe get a friend to help. It's fun to work on things together and if you have a friend with more sewing experience, she/he can help you over any rough spots. Hope you try . I'm not one really for sewing, only very small things. I love the bold and creative colors used in all the examples and would love to buy a bumper that has already been created. I can't seem to find stores that sell many bumpers by themselves that fit the scope of design that I like and prefer. I'm sorry but, I'm not one for all the same flowers and animals like most sets that are advertised in the stores. I'd much rather build my own to my liking. Do you sell any of your creations posted on here? They are readily available at online retailers like Amazon, Hancock and Jo-Ann as well as in store. I have purchased my fabric to make these bumper pads. I was wondered if they were washable. If so, does the stuffing bunch up? How do I keep it from looking mangled and lumpy if I have to wash them? Or, how do I keep the stuffing stable to avoid this issue all together (if it does bunch)? Hope you can help and thank you in advance!!! Quick question, when making the ties, when i attach the safety pin to the closed end of the fabric, and push it all the way to the bottom, how DO i get the safety pin out afterwards ?? im sure theres an incredibly simple answer to this, but im pregnant and seem to have lost my brain.. LOVE the tutorial by the way ! by far the BEST one i found on the internet ! Hi Manny -- my quick tips to help with sewing in a circle are: shorten your stitch length, use a cloth guide along the edge of your fabric to help you maintain a straight line or actually drawn the circle first on your fabric to give yourself a line to follow, and finally, stop every once in a while, with your needle in the down position, and adjust your fabric slightly to stay on your curve. Best of luck!